Four days before leaving Buenos Aires, we headed down to the Microcenter to pay Universal Cargo the moving charges (cash only and in US dollars). On the way, naturally, we stopped at Palacio Español, right off Avenida 9 de Julio. We started off with the complimentary glass of champagne, then enjoyed a half-bottle of white wine and an abundant platter of mixed grilled fish and grilled vegetables accurately suggested for sharing. Sabroso! But just being at the palacio is always a great experience. The next evening we went further afield, to Boedo and a small unassuming restaurant where we celebrated those very important occasions. Pan y Teatro is a jewel of a place almost hidden away on the intersection of a quiet residential street and a dead-end lane. The restaurant features the wines and foods of Mendoza; their artichoke salads, eggplant parmesan, stuffed red peppers, homemade breads, everything is fresh and fantastic. For this special occasion, Kurt stuck to his favorite eggplant parmesan, while Linda had the cazuela de conejo (rabbit), paired with the sensational Tannat Malbec produced by Familia Perulán. We had thought of making Pan y Teatro the venue for our last evening in Buenos Aires, but decided to move it up in the calendar for two important reasons: (1) the supply of rabbit from Mendoza dwindles as the week goes on and (2) the tango trio performs only on Friday and Saturday nights. And they are not to be missed! 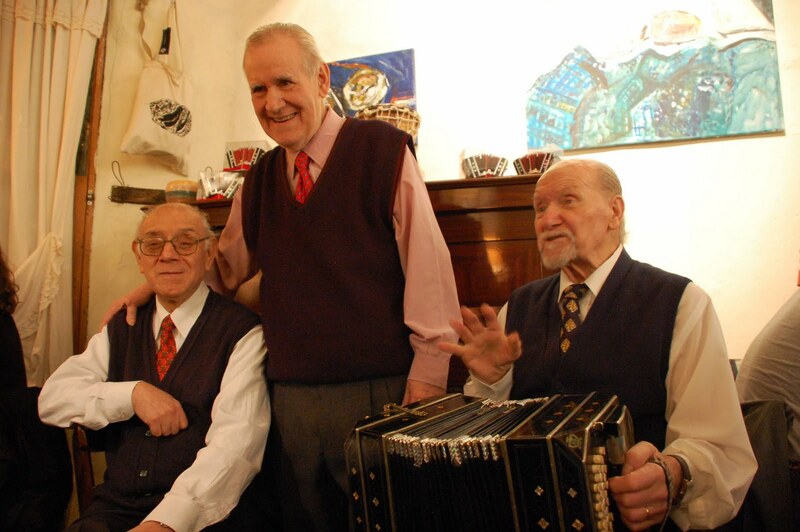 The group is composed of a pianist, a singer, and a bandoneon player, shown left to right in the photo. At 88 years old, the bandonista is the oldest of the group and has been playing for more than 70 years, including with famed nuevo tango composer Astor Piazzolla in the 1940s. He told us he attributed his longevity and musical stamina to never having smoked and limiting his consumption of alcohol to wine only. Before we left, Linda purchased one of his model bandoneons that were displayed on the piano. A fitting recuerdo of a magical place. 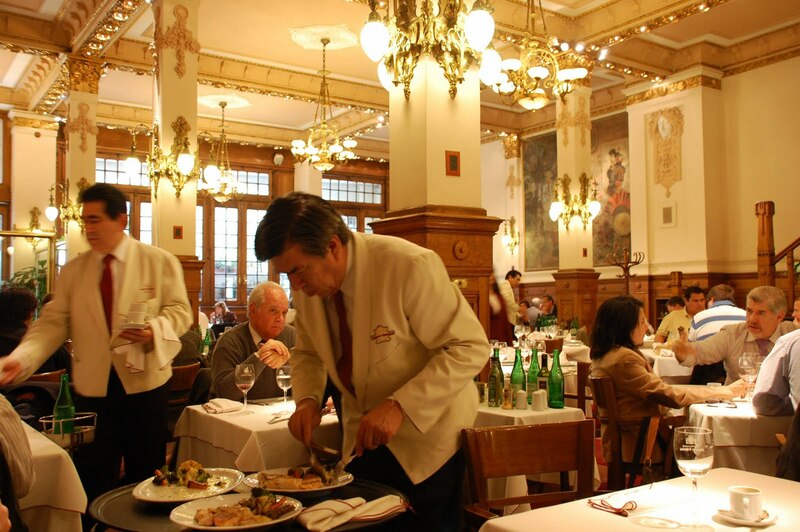 Los Pinos was the venue for our last dinner in Buenos Aires. 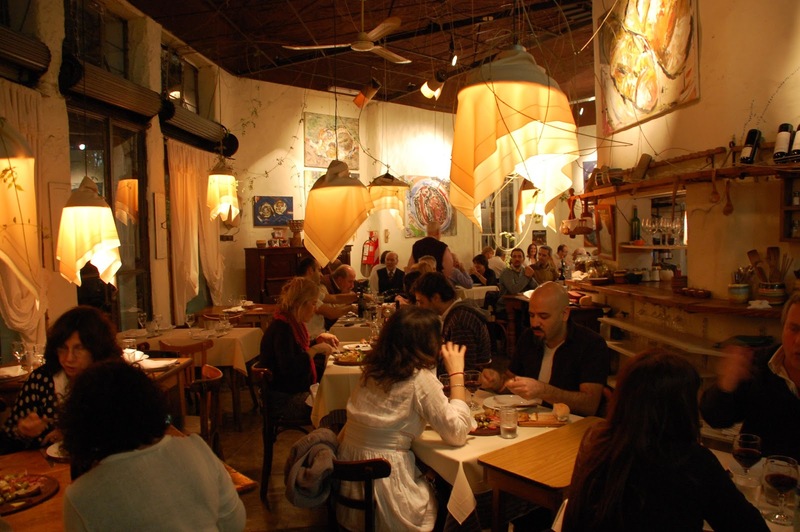 Located three blocks up from our apartment, where Azcuenaga intersects with French, Los Pinos is a quintessential neighborhood cafe: porteño comfort food (pasta, milenesas, y bifes) and basic red wines (nothing fancy). It is one of the first places we ate at on our initial trip to BA in June 2006. 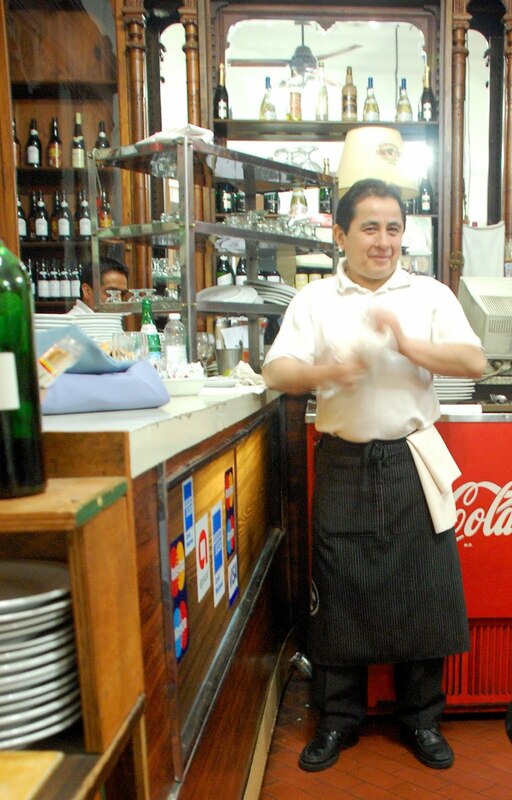 In the years that followed, the waiters came to know our favorite dishes and how we liked our bifes cooked (jugoso, not al punto, as is more customary among the Argentines). Linda in particular will miss their espinaca al la crema. And the tall tales by "Rocky" of his romantic exploits. It was cold and overcast on Monday, Aug. 15, our last day in BA. Definitely not ideal conditions for lunch at Croque Madame. So we opted instead for another Spanish restaurant, Oviedo, also a short walk away on Beruti and Ecuador. We shared a nice green salad with palmitos, veal with vegetables, and a delicious bottle of Tomero malbec, Argentina's signature wine. The proper way to bid farewell to our adopted city. Have enjoyed seeing BA through your eyes. Hope that you will blog the Panama experience as well. Have a wonderful trip! 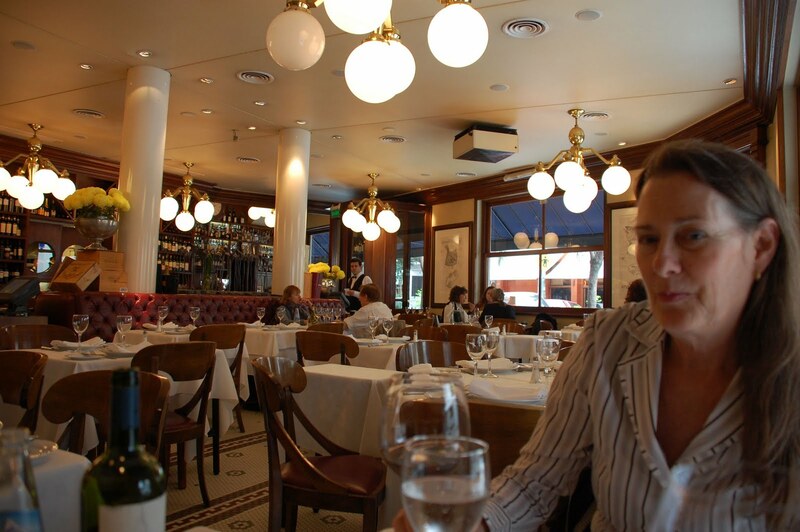 BTW....All three restaurant pictured in your blog have great ambience, there is something special about Pan y Teatro. I love the way it looks! Thanks, Cynthia! Pan y Teatro IS very very special.